are your hoomans allowing you unfettered hunting access? If she is, I would be surprised if you can’t put a severe dent in the bunny population. Maybe you just need a Polymer based attack repellent cranium cover and eye protection googles! We do need protection, Capt. angus fala worldwide has the answer……..along with, but of course, your mama’s permission. GO FOR IT BIGGGGGGGG TIME! DOWN WITH BUNNIES!! They are outside our perimeter. Clever bunnies. Mama just asked Ainsley if she had read Watership Down….a cautionary tale for sure. Mama is not a big fan of bunny bopping, so we can’t comment on this one she sez. Situation is outrageous here Mom says. Besides all the bunnies coming in, we now have a small adult or large child ground hog inside our fence. The only thing the picket with chicken wire fence keeps out are the chickens. Have never seen one of those in our yard….yet. Ground hog, bunny infestation…..launch the grenades. At least you are bigger than they seemed to be. Poor babies … I wish I had a solution to your bunny population, but I don’t. You are being invaded by bunnies. If you need help with bunny herding, I’m here for ya. We are definitely in need of some back up here. Oh dear. Jacques would have a conniption fit if he saw that!! He keeps the bunnies on their toes here. I bet you guys do too. 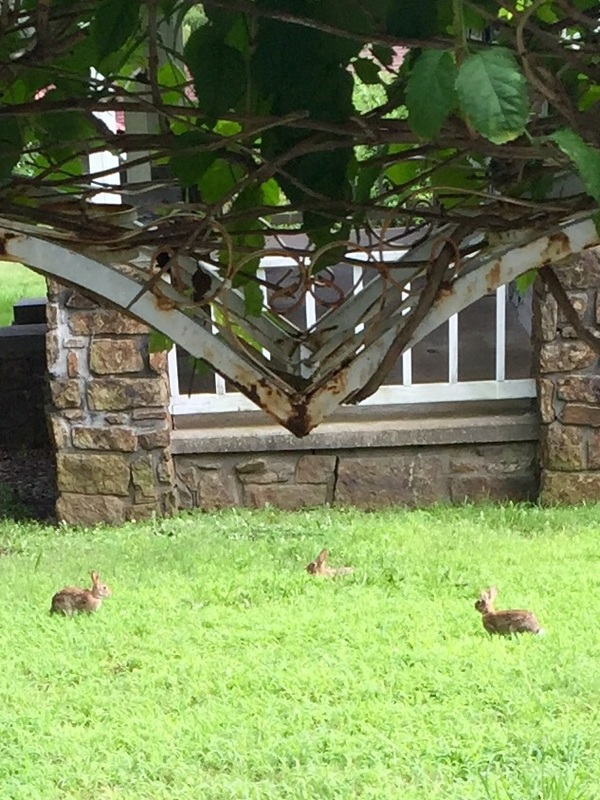 It’s a bunny fiesta right outside our fence.